Welcome to Part 2 of the interview with Ms. Valerie Hoekstra, Inwood Academy’s Middle School Director. See Part 1 here. Q. Based on your five years of experience at Inwood Academy, are you making any major changes at the middle school? We spent a lot of time focusing on academics and trying to make it rigorous, not necessarily test-focused and in the last year and a half we have figured out exactly what our students need academically and we know how to deliver rigor in an engaging way. What we need to get back to a little bit is what we started with the first couple of years where our students see themselves as learners and understand that when they walk into the classroom they have a responsibility to bring something to the classroom as well. It’s not new, just that’s where our focus is going to be. We’re going to focus on that reluctant learner. We’re going to focus on students seeing themselves as learners and then being able to use other students in the classroom as resources instead of obstacles, sometimes to their learning. Students will have a mental check list: I’m struggling on something and I’m going to use the strategy that I’ve learned to persevere a difficult problem. I may go ask one of the other students to see what they are doing to solve this type of problem, then go back and work on it again and finally see the teacher but to persevere through that learning. We’re going to focus on that reluctant learner. Q. And giving them the steps that they need to take to persevere? No. There has to a recognition that I’m at a point where I’m about ready to give up. It’s being aware of how you are thinking, being aware of how you are feeling. Sometimes we don’t know when we are struggling. We don’t know why we are frustrated. You kind of mentally shut down. The first thing is to recognize that is happening. So, it’s not so much steps but a toolkit with steps of things that they can do in order to persevere as learners. It’s part of our five character traits. The responsibility part of it, especially for learning. It’s students understanding that they bring something into the classroom every day and that’s different than walking into the classroom and thinking what’s the teacher going to tell me today, instead of what do I need to do to learn today. That, I think, is big. This is teaching them to be students and really being participants in the classroom. Our teachers have been fabulous at building lessons and differentiating it for different students and making it engaging, and we will continue that. So that academic rigor will continue just as before, and teachers will continue to develop beautiful lessons, and we will get our students to walk into the door ready to receive it! In order to help students to see themselves as learners and have the ability to persevere any kind of task, we are implementing a new advisory program. 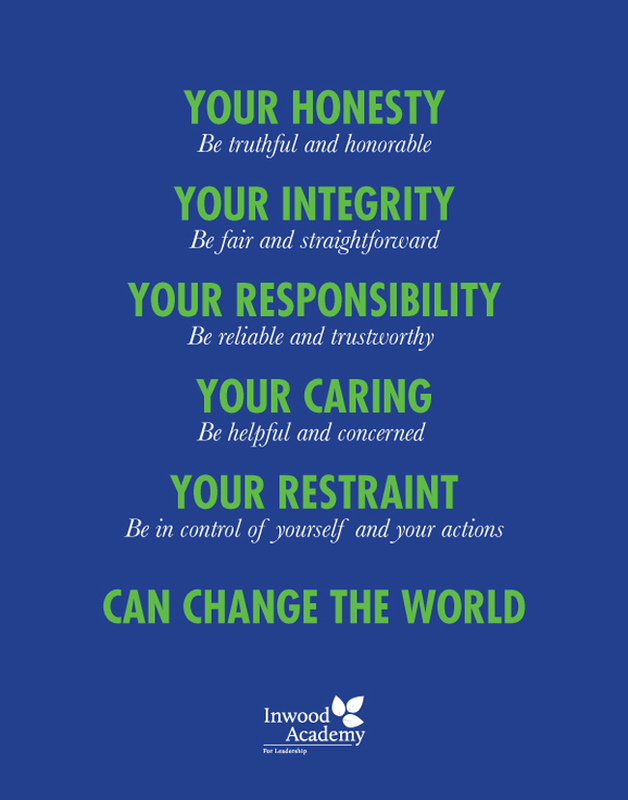 We will have small group advisory with one staff member and eight to ten students, three to four times per week for 25 minutes with lessons around our five character traits. That group, I envision, becomes the safe space for students, a cohesive group where students can rely on each other and talk to their advisor. It’s students understanding that they bring something into the classroom every day and that’s different than walking into the classroom and thinking what’s the teacher going to tell me today, instead of what do I need to do to learn today. That, I think, is big. Q. I heard you want to involve parents more in the school. Can you talk about that? For the first time we have a full time parent coordinator, Nancy Betances. She has been with the school since the beginning and parents know and love her. In her new role, she is the liaison between the parents and the school, an advocate for parents, bringing what the school is doing to the parents, education, and setting up volunteer opportunities. One of the things that a lot of parents have said they want to do is be in the classroom more and we want to have them in the classroom more. Our model for parent involvement will come from the staff council, to hear how they want to use parents in a classroom so we can set up something that is cohesive across the board. Nancy will work with the staff council to do that and work with the families to implement it. Q. Are you doing anything differently than what you originally wrote in Inwood Academy’s charter application from 2009? We figured out that Response to Intervention (RTI) we were using mainly at first for our special needs population actually works with everybody and that’s really the way it’s supposed to be. Because of the way our teachers evaluate who understood a lesson that day, it may not be the special education students who end up in the group that needs the extra help that day. It doesn’t really matter to us if they are the group that needs the help that day or not as long their understanding was accessed. On the other hand, a top student in the school typically might be in a group that needs the extra help that day, just for that one specific area. Because we have a lot of children that are English language learners and they may have no difficulty with math but when it comes to expressing themselves they may find themselves in a group that is getting the extra help even if they don’t have an IEP. Q. 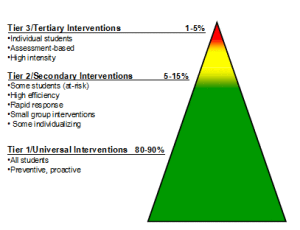 You said using Response to Intervention is for all students and that’s the way it should be. Is that because of new teaching standards or a law that RTI is to be used for all students? I think it’s the spirit of the law. So you have a tier, one group of full time special ed students, then a group in the middle who gets a certain amount of help, and then the biggest percentage of students are supposed to be those in general education who do not need services at all. It looks like each tier are completely separate. Yet, when you read about RTI if a learner is responding to something that you do you need to move them into a more independent work environment, and if they are not responding then you may need try something that gives them more support. The truth is that just doesn’t happen for special education students and it can’t possibly. 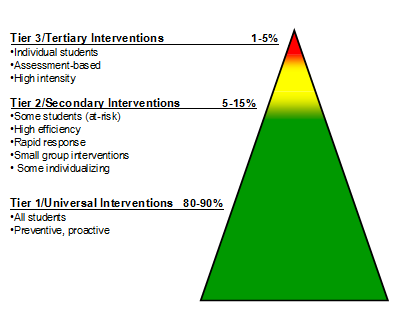 So while you might just want to move that first tier of learners up and down you really have to move everybody and that’s what I think it (RTI) was really intended to be. What’s going on at the moment is where we are going to catch them in learning. It’s really looking at what students can do regardless of what we know about them from a test that they took because that doesn’t define what’s going on in the moment. What’s going on at the moment is where we are going to catch them in learning. The more often we use growth data and targets for every child and we see individually what they are able to do, the better. Hopefully, it’s where education is going. Q. Do you think charters do a better job of that? That’s a good question. I think there’s more talk about it in the charter school world but there are a lot of progressive independent and traditional public schools who also have this model. A lot of schools are not going after the one size fits all, but in high performing schools it’s probably their model. Q. What role does test data play at the middle school? Oh boy (checks the time). Test data is really important. We use test data every day but our tests could be as easy as here’s your exit ticket, answer this question. An exit ticket will be one question on the lesson of the day, the objective of the day. Teachers use that to inform their instruction for the next day. We also have unit tests designed by teachers to see if their students get the content, did they understand what was going on, and how well are they writing and are they improving in their writing and those kinds of things. We use this data every day. We have the state test scores which are helpful to see how we are doing as teachers moving students along but that’s more of a benchmark for them. Because we don’t get back (the results) for quite a while for individual student results and we don’t get every question anyway we don’t have timely or as clear data that we would like to have from the state tests. They, obviously, can’t give out all of the test data because that would invalidate the test. Then we have NWEA which our students take three times a year. It’s a national standard for measuring real growth and we’ve used it since the beginning. We can see where a child started with us and it doesn’t matter how low they are. For the students who start with us in our fifth grade and they’re at first grade reading, we know the state test is too difficult for them and they won’t pass it, but with the NWEA data we can see growth against the targets we set for them. We can’t do that with the state test data. Q. What does an ideal classroom look like to you? There really isn’t an ideal classroom. There are ideal teachers. There are teachers whose personality come through in a classroom and that to me is ideal. I also think an ideal classroom is when teachers use their personalities—that could be somebody who is really kind of boring to someone who is really exciting or really intense—but every student is involved and sees themselves as a learner in that class and knows that if they are not doing their part the class suffers, and the student doesn’t want that to happen.